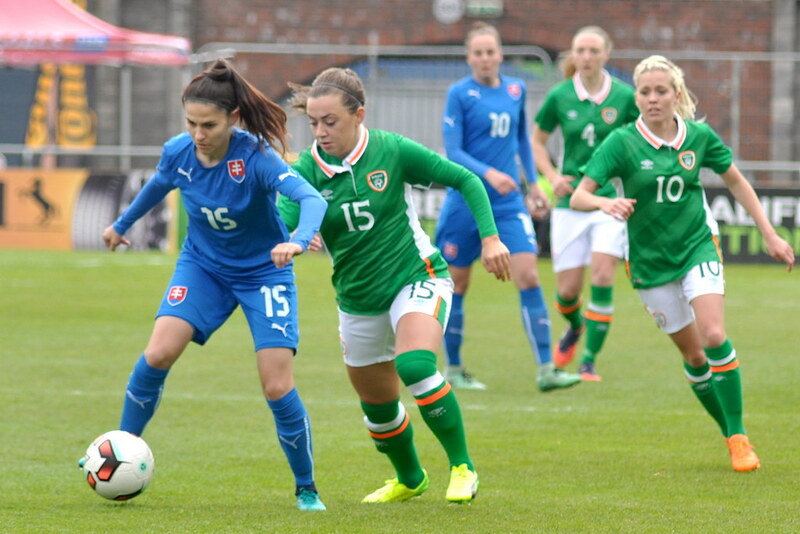 A tortuous week was brought to satisfying conclusion for the Republic of Ireland as Steph Roche's penalty two minutes after the break sealed a 1-0 victory over Slovakia at Tallaght Stadium. Roche sent Slovakia goalkeeper Lucia El Dahabiova the wrong way from 12 yards, for what should have been the first of several goals, as the crowd 1,037 returned to their seats for the second half. Ireland manager Colin Bell, taking charge of his first home game since assuming the reins from Sue Ronan, set up with an attacking shape led by Sunderland's Roche. 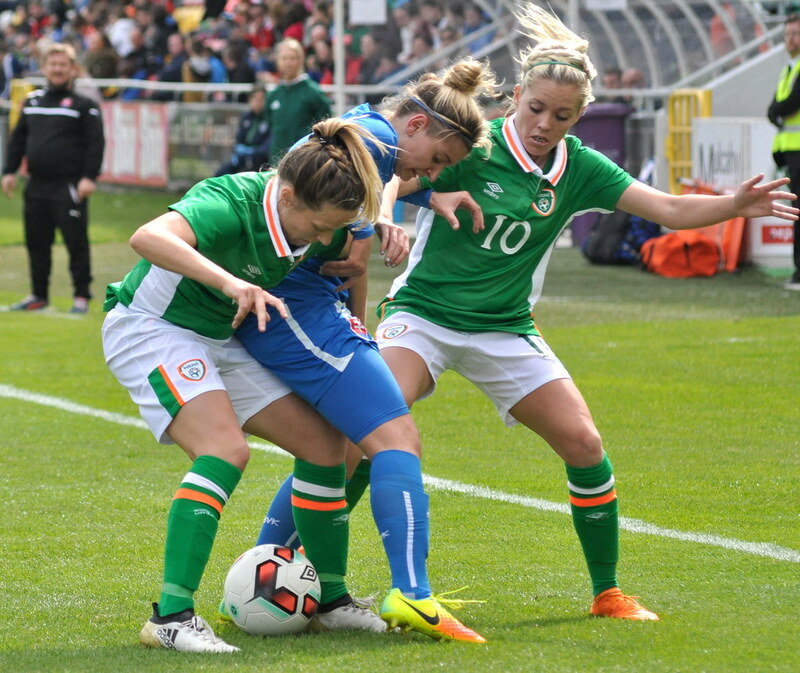 Behind her, Arsenal's Katie McCabe, Florida State University's Connolly, Houston Dash's Denise O'Sullivan and Aine O'Gorman of UCD Waves formed a potent attacking unit. And it was the Kilnamanagh winger McCabe, playing in front of her hometown crowd, who stole the show on the night, supplying the ball that led to the award of the penalty and dazzling with her skill off either flank. 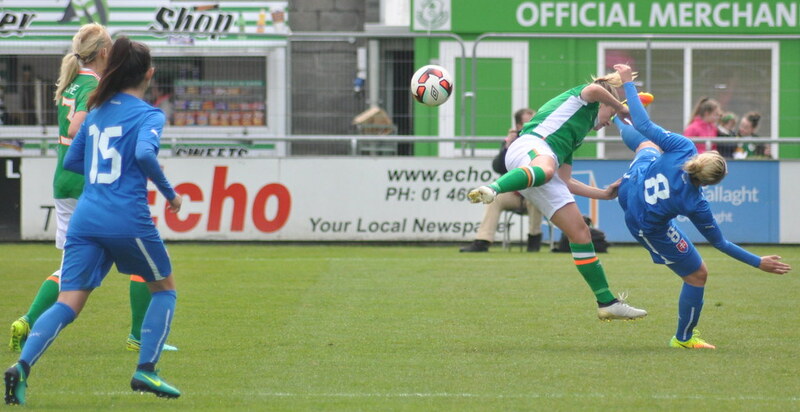 Roche provided the game's first shot on goal, however, as she curled a free kick over the bar after O'Sullivan received a knee in the back from Slovak midfielder Alexandra Biroova. 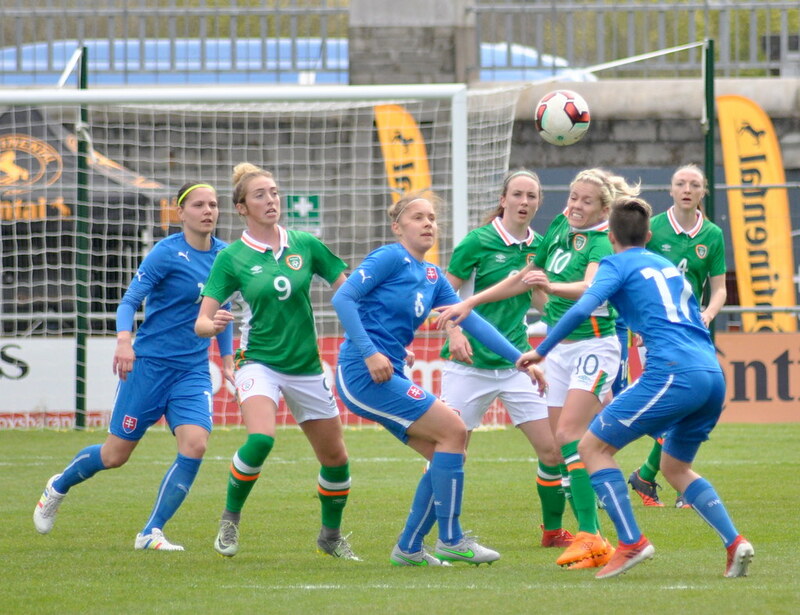 From a near-identical position at the other end, Slovakia's Maria Mikolajova tested Emma Byrne's reflexes with a shot over the wall but the Brighton stopper watched it the whole way. 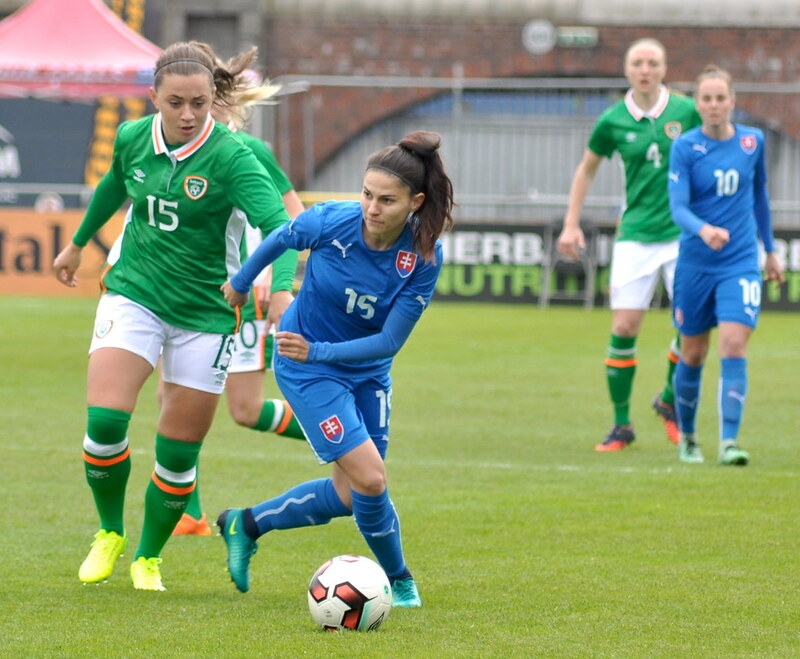 Slovakia captain Lucia Hasanayova was forced off after just 14 minutes after going over on her ankle, and the introduction of Valentina Susolovo heralded a shift to defence for Biroova. McCabe showed the first glimpse of her potential as she turned Lucia Suskova from Harriet Scott's throw and reached the endline before fizzing a ball across goal that Roche couldn't quite stretch to meet. The hosts should have taken the lead five minutes from the break when an inch-perfect through ball from Connolly set O'Sullivan clear, but she was denied not once but twice close in by El Dahabiova. And there were barely 60 seconds played in the second half when McCabe, switched to the right for the second half, crossed for Connolly, who won a somewhat soft penalty after her attemped shot was impeded by Suskova. There was nothing soft about Roche's spot-kick, however, as the former Puksas Award nominee waited for El Dahabiova to move left before calmly slotting the ball to her right and into the net. From there, there was only ever going to be one winner as the home side played with more poise and control and the visitors gradually began to retreat into their shells. This may have been partly to do with the loss of full-back Petra Zdechovanova to what looked like a potential leg break – she left the field on a stretcher and her distress was clear as she covered her eyes. 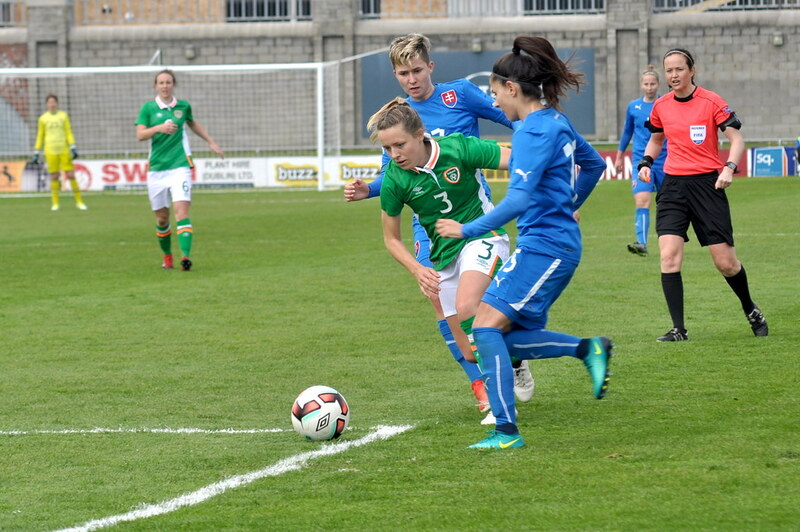 McCabe continued to show her class as she dispossessed Patricia Hmirova in midfield and played in Roche, who set herself before curling the ball narrowly wide of the post. And it was McCabe's right-wing corner that would have led to a second goal had either O'Sullivan or Connolly been able to stab home from close range when the ball was allowed to bounce inside the six-yard box. O'Gorman let another gilt-edged chance slip when Louise Quinn flicked on her central defensive partner Diane Caldwell's long diagonal free. The ball sat up nicely, but the UCD attacker swiped at fresh air. More beautiful skill from McCabe on the right saw her nutmeg Hmirova and drive infield before letting fly from 25 yards only for a slight deflection to take the sting out of the shot. 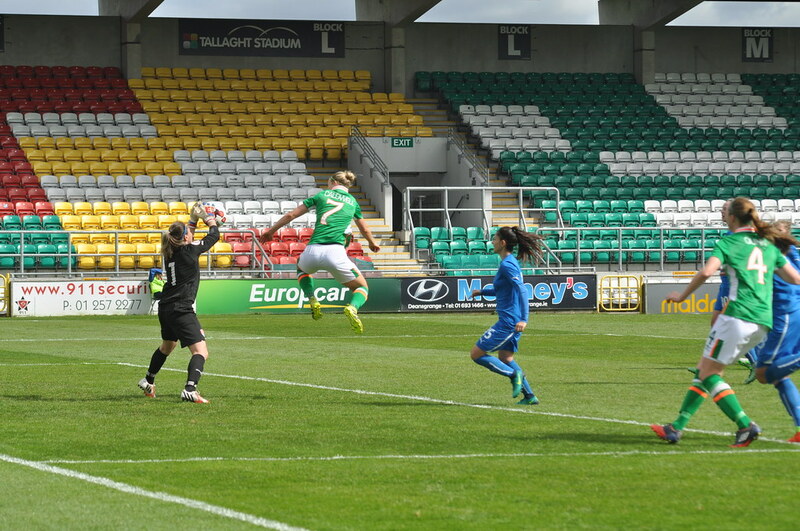 Karen Duggan's miscontrol in midfield led to a snapshot for the lively Mikolajova, calling substitute Marie Hourihan, the Manchester City goalkeeper, into action for the first time in an Ireland shirt with 15 minutes remaining. The ex-England under-23 cap replaced Byrne at the break but such was the dominance of Bell's side that she couldn't have anticipated more of an armchair ride had she remained on the bench. Roche almost doubled her tally eight minutes from the end as she lifted the ball over El Dahabiova, only to see Diana Bartovicova, who had moved from striker to centre half, hook the ball off the line. McCabe left the field in injury time to rapturous applause as the unanimous player of the match, and her replacement Claire O'Gorman could have sealed it within seconds of her introduction. The Wexford Youths Woman nicked the ball past the outrushing El Dahabiova, only to see the ball trackle just inches wide of the upright. It wasn't to matter as a revitalised Ireland side ended a week defined by off-field victories with success on it as they made it three wins from five under Bell's stewardship. 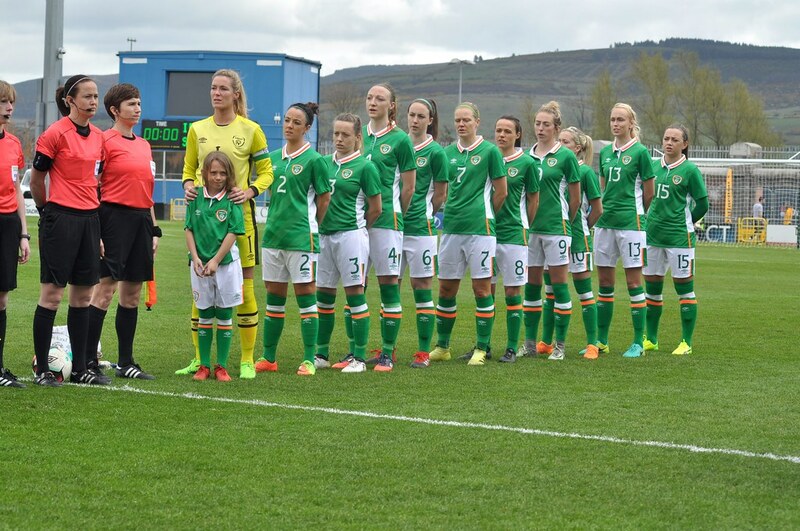 Republic of Ireland: Emma Byrne (Marie Hourihan 46); Sophie Perry, Diane Caldwell, Louise Quinn, Harriet Scott; Karen Duggan, Megan Connolly (Julie-Ann Russell 74), Denise O'Sullivan, Aine O'Gorman, Katie McCabe (Claire O'Riordan 90+2); Stephanie Roche (Ruesha Littlejohn 87). 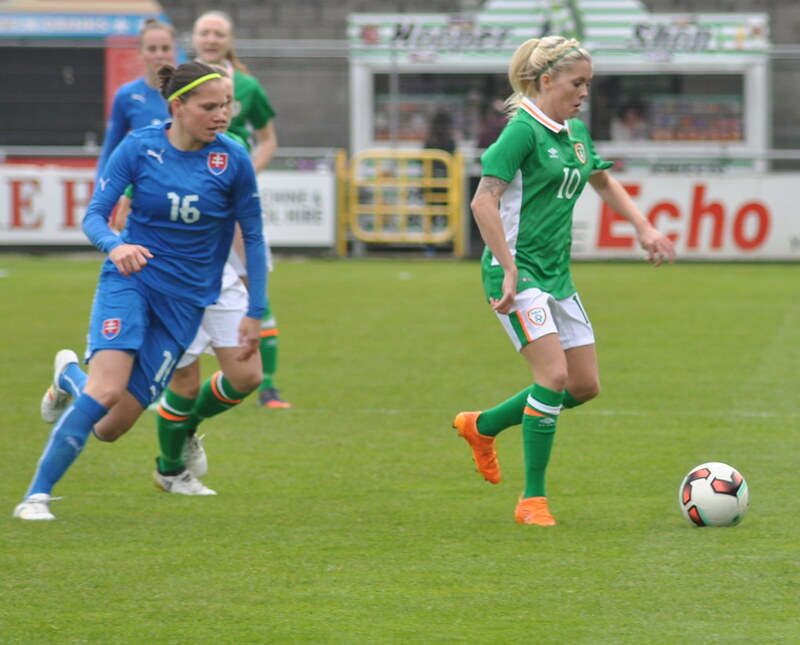 Subs not used: Niamh Reid-Burke (gk), Jetta Berrill, Savannah McCarthy, Keeva Keenan, Meabh De Burca, Clare Shine. Slovakia: Lucia El Dahabiova; Lucia Suskova, Lucia Harsanyova (Valentina Susolova 14), Kristina Kosikova (Terezia Kovalova 79), Petra Zdechovanova (Veronika Slukova 66); Alexandra Biroova, Maria Mikolajova, Stanislava Liskova (Adrian Brissova 67), Klaudia Fabova (Monka Havranova 58), Patricia Himrova; Diana Barticova. Subs not used: Andrea Horvathova. 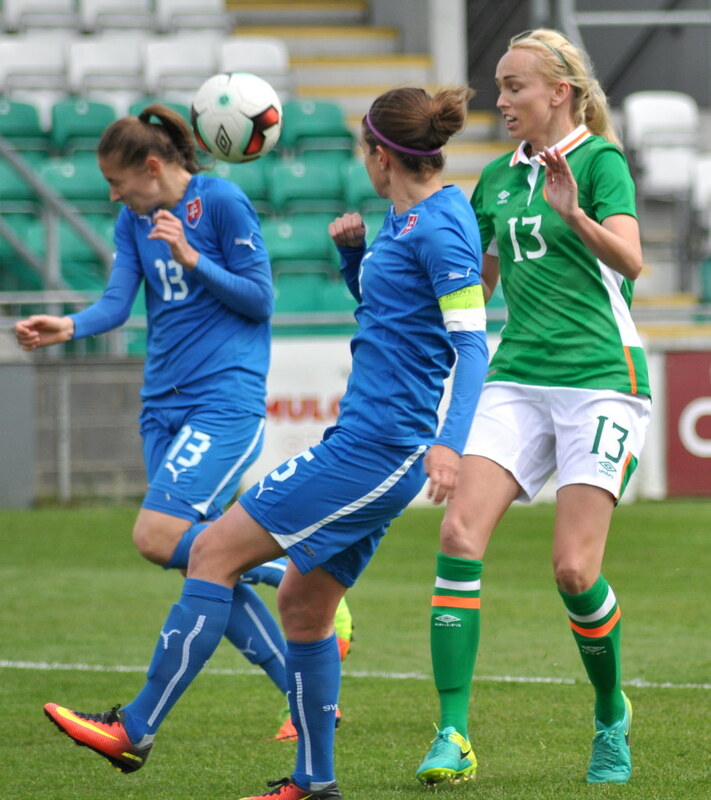 Extratime.ie Player of the Match: Katie McCabe (Republic of Ireland).